Global inflows of foreign direct investment (FDI) declined in 2003 for the third year in a row, to $560 billion (table 1). This was prompted again by a fall in FDI flows to developed countries: at $367 billion, they were 25% lower than in 2002 (table 2). Worldwide, 111 countries saw a rise in flows, and 82 a decline. The fall in flows to the United States by 53%, to $30 billion – the lowest level in the past 12 years – was particularly dramatic. FDI flows to Central and Eastern Europe (CEE) also slumped, from $31 billion to $21 billion. It was only developing countries as a group that experienced a recovery, with FDI inflows rising by 9%, to $172 billion overall. But in this group, the picture was mixed: Africa and Asia and the Pacific saw an increase, while Latin America and the Caribbean experienced a continuing decline. The group of 50 least developed countries (LDCs) continued to receive little FDI ($7 billion). Prospects for 2004, however, are promising. Cross-border mergers and acquisitions (M&As) – still low at $297 billion in 2003 – began to pick up. They rose by 3% in the first six months of 2004 over the same period in 2003. This, combined with other factors – higher economic growth in the main home and host countries, improved corporate profitability, higher stock valuations – points to a recovery of FDI flows in 2004. Reflecting higher profits, reinvested earnings – one of the three components of FDI flows – had already resumed growth in 2003, reaching a record high. Other components of FDI (equity and intra-company loans) are also expected to pick up in 2004. The continuing liberalization of FDI regimes may help the recovery. 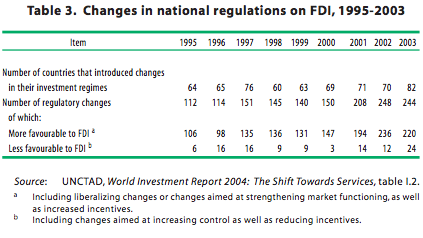 There were 244 changes in laws and regulations affecting FDI in 2003, 220 of which were in the direction of more liberalization (table 3). In that year, 86 bilateral investment treaties (BITs) and 60 double taxation treaties (DTTs) were concluded, bringing the totals to 2,265 and 2,316, respectively. However, the annual number of new treaties concluded has been declining, since 2002 in the case of BITs and since 2000 in the case of DTTs. Surveys, conducted by UNCTAD during the first quarter of 2004, of 335 of the world’s largest transnational corporations (TNCs) (from developed, developing and transition economies) and 87 international site-selection experts corroborate the optimistic outlook for FDI flows. Flows are expected to pick up, particularly in Asia and the Pacific and CEE. China and India in Asia and Poland in CEE are considered to be especially well positioned for an upswing. Prospects are particularly bright for some services and for electrical and electronic equipment, motor vehicles and machinery, according to these experts. The relocation of a wide range of corporate functions is set to continue. Greenfield investment is predicted to dominate FDI in developing countries, and cross-border M&As in the developed world. Investment promotion agencies (IPAs) (also surveyed by UNCTAD in early 2004) anticipate sustained competition for FDI, with incentives and targeting viewed as key tools for investment promotion. A recovery in FDI will further boost international production, presently carried out by at least 61,000 TNCs with over 900,000 foreign affiliates, representing an FDI stock of about $7 trillion. International production remains fairly concentrated: in 2002, the world’s 100 largest TNCs, representing less than 0.2% of the global universe of TNCs, accounted for 14% of sales by foreign affiliates worldwide, 12% of their assets and 13% of their employment. 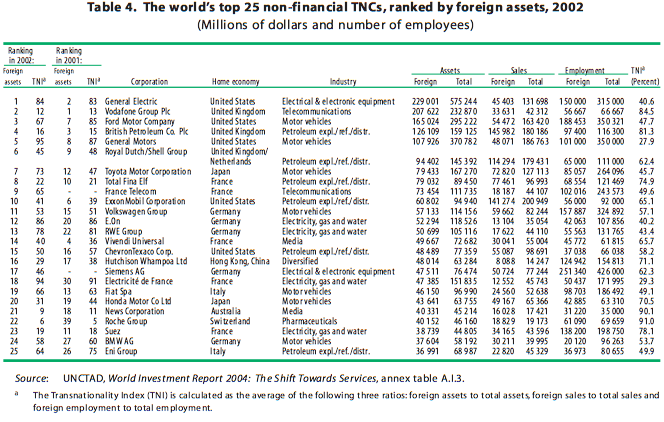 Following a period of stagnation, these TNCs resumed growth in terms of their assets, sales and employment in 2002 (see table 4 for the top 25 of these firms). A recovery does not mean that all countries will realize their FDI potential. Indeed, UNCTAD’s Inward FDI Performance Index, a measure of the attractiveness of a country to FDI, shows that economies such as the Czech Republic, Hong Kong (China) and Ireland continued to attract significant investment even during the FDI recession. In contrast, countries such as Japan, South Africa and Thailand have yet to realize their full potential to attract FDI, according to their ranking on UNCTAD’s Inward FDI Potential Index as compared with that on the Inward FDI Performance Index. …driven by TNCs from developed countries, but with increasing participation by developing-country firms. As in the past, TNCs from developed countries will drive the renewed growth of world FDI flows. But, increasingly, TNCs from developing countries are contributing too. Their share in the global FDI flows rose from less than 6% in the mid-1980s to some 11% during the latter half of the 1990s, before falling to 7% during 2001-2003 (for an annual average of $46 billion). They now account for about one-tenth of global outward FDI stock, which stood at $859 billion after rising by 8% in 2003. Measured as a share of gross fixed capital formation, some developing countries invest more abroad than some developed ones: e.g. Singapore (36%, during 2001-2003), Chile (7%) and Malaysia (5%), compared to the United States (7%), Germany (4%) and Japan (3%) (table 5). As the economic recovery takes hold, FDI from these and other developing countries can be expected to resume growth. Is a new geography of FDI flows in the making, complementing the new geography of trade? 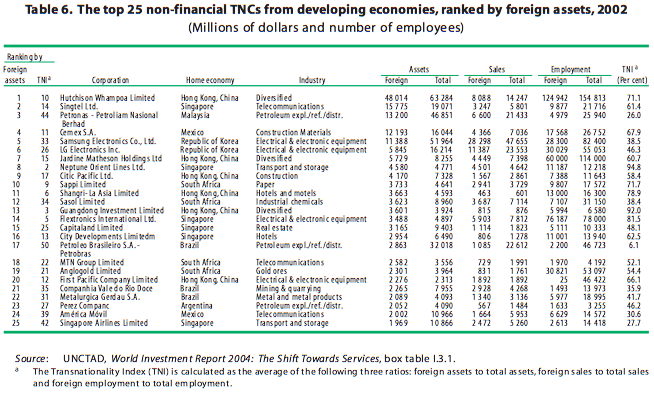 It may well be: the top 50 developing-country TNCs are becoming transnationalized (as measured by UNCTAD’s Transnationality Index) at a faster rate than their developed-country counterparts (see table 6 for the top 25 of these firms). They are led by firms from developing Asia. FDI outflows from that region have averaged $37 billion per year over the past three years (almost comparable to average annual world FDI flows in the first half of the 1980s), or four-fifths of all outflows of developing countries. Latin America and the Caribbean accounts for another $10 billion, while outflows from Africa are much smaller and come mainly from South Africa. A good part of investment flows from developing countries goes to other developing countries. In developing Asia, for example, they account for some twofifths of total inflows. And flows between developing countries are growing faster than flows between developed and developing countries. Notwithstanding rising FDI from the developing world, developed countries continue to account for over 90% of total outward FDI. In fact, the ownership advantages of TNCs based in countries with significant outward FDI, such as the Netherlands, Sweden, Switzerland and the United Kingdom, appear to be getting stronger. UNCTAD’s Outward FDI Performance Index, presented for the first time in WIR04, reveals how countries vary in this regard. 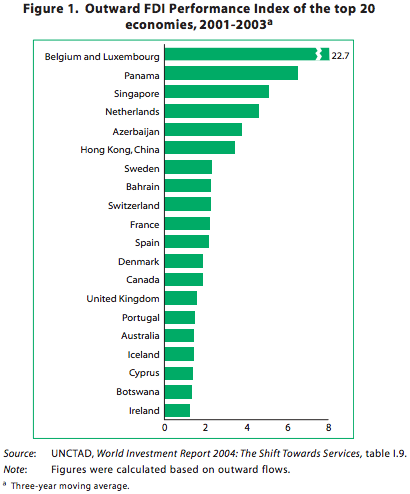 Ranked according to this Index – measured as the ratio of a country’s share in world outward FDI flows to its share in world GDP – the leaders are Belgium and Luxembourg (because of transshipped FDI), Panama and Singapore. But the four countries mentioned earlier as well as other developed countries also figure among those at the top of the list (figure 1). 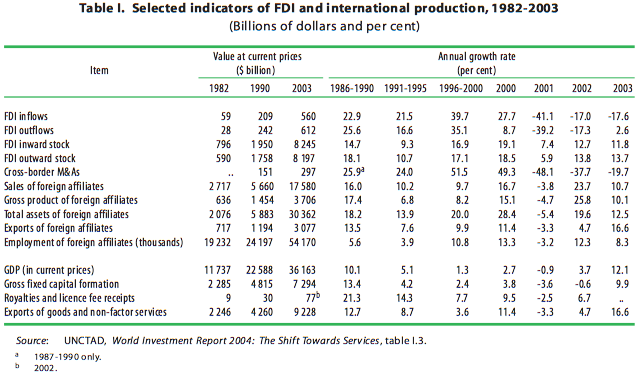 FDI inflows to Africa rose by 28%, to $15 billion, in 2003, but fell short of their 2001 peak of $20 billion (table 2). Thirty-six countries saw a rise in inflows, and 17 a decline. The recovery was led by investment in natural resources and a revival of cross-border M&As, including through privatizations. Morocco was the largest recipient of inflows. Overall, natural-resource-rich countries (Angola, Chad, Equatorial Guinea, Nigeria, South Africa) continued to be the principal destinations, but a large number of smaller countries shared in the recovery. FDI in services is increasing, particularly in telecommunications, electricity and retail trade. In South Africa, for instance, FDI in telecommunications and information technology has overtaken that in mining and extraction. Africa’s outlook for FDI in 2004 and beyond is promising, given the region’s natural-resource potential, buoyant global commodity markets and improving investor perceptions of the region. Leading TNCs surveyed by UNCTAD in 2004 viewed the region’s prospects less favourably than those for other regions: only one out of five respondents expected higher inflows over the next two years, and twothirds believed flows would remain unchanged. Continuing improvements in regulatory frameworks should facilitate FDI inflows into African countries. In 2003, a number of them further liberalized their FDI regimes, and some resumed privatization programmes. Several countries concluded or made progress in negotiations on free trade agreements (FTAs). The extension of the African Growth and Opportunity Act (AGOA) of the United States to 2015, through the AGOA Acceleration Act of 2004, should facilitate the expansion of international production in Africa. The rebound of inflows to the Asia-Pacific region, up by 14%, to $107 billion in 2003 (table 2), was driven by strong domestic economic growth in key economies, improvements in the investment environment, and regional integration that encourages intraregional investment and facilitates the expansion of production networks by TNCs. The outbreak of the Severe Acute Respiratory Syndrome (SARS) had only a marginal effect on FDI flows to the region. Overall, 34 economies received higher inflows, and 21 lower ones. Within the region, there was considerable unevenness of FDI flows to different subregions and countries, as well as industries. Overall, inflows were concentrated in North-East Asia ($72 billion in 2003) and in services. 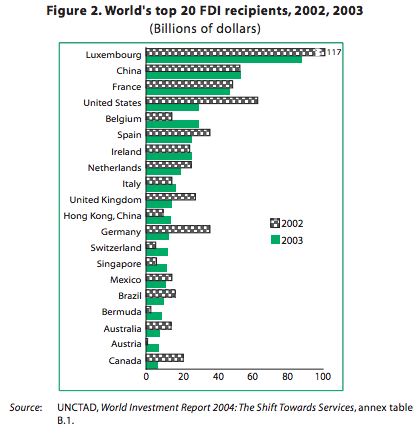 Setting aside the special case of Luxembourg (owing to transshipping), China became the world’s largest FDI recipient in 2003, overtaking the United States, traditionally the largest recipient (figure 2). Flows to South-East Asia rose by 27% to $19 billion. South Asia received only $6 billion, in spite of a 34% increase. Flows to resource-rich Central Asia rose from $4.5 billion in 2002 to $6.1 billion, and to West Asia from $3.6 billion to $4.1 billion. Flows to the Pacific islands remained low (at $0.2 billion), despite a noticeable increase in FDI to Papua New Guinea. The FDI stock in services climbed from 43% of the region’s total inward stock in 1995 to 50% in 2002, while that of manufacturing fell to 44%. In the primary sector, oil and gas, in particular, were magnets. While manufacturing attracted the most FDI in China, the share of services in FDI inflows to other economies rose in absolute and relative terms. This is especially true for the newly industrializing economies and the ASEAN subregion. Regional cooperation agreements, such as the ASEAN Framework Agreement on Services, helped. On the national policy front, Asia-Pacific countries continued to liberalize their FDI policies and improve their investment climate. Most countries have already concluded BITs and DTTs with their principal investment partners. They have also improved cooperation amongst themselves, with the conclusion of several FTAs in 2003, and other economic arrangements with investment components. FDI prospects for the region continue to be strong: almost threefifths of the top TNCs surveyed by UNCTAD expected FDI to increase over the next two years. In particular, prospects for China, India and Thailand were considered bright. There is less optimism for West Asia, with 13% of the respondents predicting a deterioration. For the fourth year in a row, FDI flows into Latin America and the Caribbean (LAC) fell, by 3% in 2003, to $50 billion (table 2). This is the lowest annual level of inward FDI since 1995. Of 40 economies, 19 saw declining inflows. In particular, declines were registered in Brazil and Mexico, the region’s largest recipients. With privatization running out of steam, weak economic recovery in the European Union (EU) (the region’s principal source of FDI, apart from the United States) and recession or slow growth in several countries in the region in the aftermath of the Argentine crisis, LAC has been hit hard by the FDI downturn. The apparent decline of the maquila industry added to concerns that Mexico might be losing attractiveness for FDI. Several smaller economies, such as Chile and Venezuela, registered increases in 2003, the former recouping its losses of the previous year. As a result, the region’s share in developing-country inflows has returned to the levels preceding the latest FDI boom. In 2003, FDI outflows from LAC rose to $11 billion. With economic growth in LAC expected to pick up, there is optimism that a recovery in FDI inflows will follow. Indeed, a substantial share of corporate executives expect an increase, according to UNCTAD’s TNCs survey. Several countries are putting more emphasis on further liberalizing their FDI regimes and streamlining administrative procedures for investors. The unexpected plunge in FDI flows into Central and Eastern Europe, from $31 to $21 billion (table 2), was mainly due to the Czech Republic and Slovakia, two of the largest recipients in the region. Overall, inflows rose in ten countries and fell in nine. Inflows to the Russian Federation also declined, from $3.5 billion to $1 billion. By contrast, outflows from CEE rose from $5 billion to $7 billion, with the Russian Federation accounting for three-fifths of that figure. Four out of the five top TNCs in 2002 among the region’s 25 largest TNCs were Russian (table 7). FDI by Russian firms is motivated by a desire to gain a foothold in the enlarged EU, and a desire to control their value chains globally. TNCs from other CEE countries seek to improve their competitiveness by focusing their investment on the lower income CEE countries or developing countries. Far from diverting FDI flows from the old members of the EU, the accession eight from CEE (the Czech Republic, Estonia, Hungary, Latvia, Lithuania, Poland, Slovakia, Slovenia) actually saw their FDI inflows shrink, from $23 billion in 2002 to $11 billion in 2003. As part of their efforts to enhance their attractiveness to investors (domestic and foreign), several new EU members have lowered their corporate taxes to levels comparable to those in locations such as Ireland. The combination of relatively low wages, low corporate tax rates and access to EU subsidies – enhanced by a favourable investment climate, a highly skilled workforce and free access to the rest of the EU market – makes the accession countries attractive locations for FDI, both from other EU countries and from third countries. Not surprisingly, therefore, prospects for FDI into CEE are promising: more than two-thirds of the top TNCs and location experts surveyed by UNCTAD expected an upturn in FDI inflows during 2004- 2005, the highest proportion of such responses among all regions. IPAs will help, according to survey results, especially through more targeting and further FDI policy liberalization. …and uneven performances in the industrialized world. 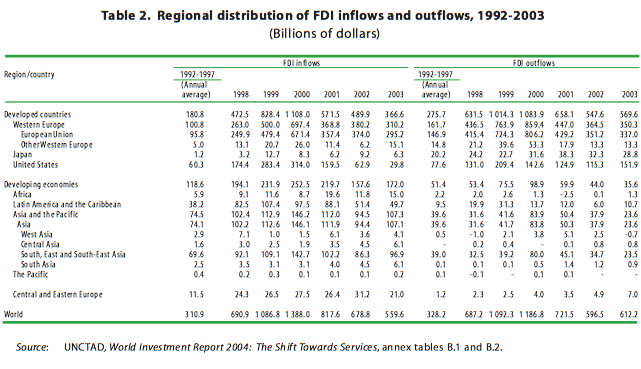 The year 2003 saw a mixed FDI picture for the developed countries: ten posted higher inflows and 16 lower ones. Overall, inflows declined by 25%, to $367 billion (table 2). Intra-company loans plunged and, to a lesser extent, equity flows (two of the three components of FDI flows). However, reinvested earnings rose, thanks to improved profitability. The slow pace of economic recovery did not help. Crossborder M&As fell in number and value for the third year running. United States FDI inflows halved, from $63 to $30 billion, which placed that country behind Luxembourg (because of transshipped FDI), China and France. Flows into the EU as a whole declined by 21%, to $295 billion. At the same time, FDI outflows from developed countries increased by 4% (to $570 billion), largely owing to higher outflows from the United States – they rose by close to a third, to $152 billion. The United States was again the largest source of FDI, followed by Luxembourg (because of transshipped FDI), France and the United Kingdom, in that order. Higher FDI outflows and lower inflows combined for a negative net balance of $122 billion for the United States on these two items, the largest such deficit ever. FDI prospects for developed countries for 2004 and beyond are favourable. The first six months of 2004 saw an upsurge in announced M&As, suggesting a more positive scenario for the second half of that year. The findings of UNCTAD’s surveys of TNCs and location experts were less optimistic regarding prospects for Western Europe than for North America and Japan. The structure of FDI has shifted towards services. In the early 1970s, this sector accounted for only one-quarter of the world FDI stock; in 1990 this share was less than one-half; and by 2002, it had risen to about 60% or an estimated $4 trillion (figure 3). Over the same period, the share of the primary sector in world FDI stock declined, from 9% to 6%, and that of manufacturing fell even more, from 42% to 34%. On average, services accounted for two-thirds of total FDI inflows during 2001-2002, valued at some $500 billion. Moreover, as the transnationalization of the services sector in home and host countries lags behind that of manufacturing, there is scope for a further shift towards services. Outward FDI in services continues to be dominated by developed countries, but has become more evenly distributed among them (table 8). 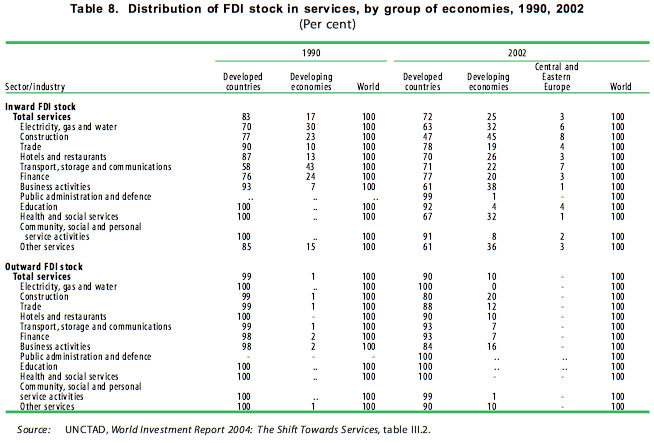 A few decades ago, almost the entire outward stock of services FDI was held by firms from the United States. By 2002, Japan and the EU had emerged as significant sources. 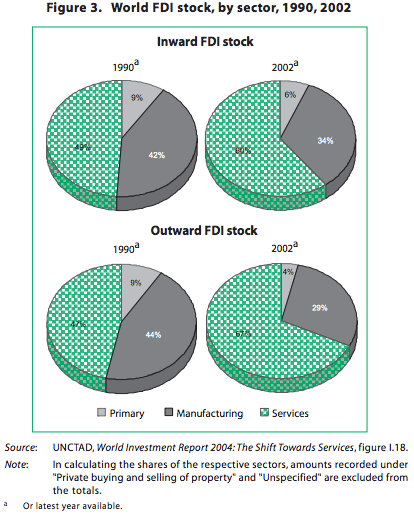 Developing countries’ outward FDI in services began to grow visibly from the 1990s. Their share in the global outward FDI services stock climbed from 1% in 1990 to 10% in 2002, faster than in other sectors. Trade and trade-supporting services by manufacturing TNCs expanded particularly rapidly, while business services, hotels and restaurants, and financial services also grew. On the inward side, the distribution of services FDI stock has been relatively more balanced, though developed countries still account for the largest share. The fastest growth has taken place in Western Europe and the United States, reflecting the fact that most service FDI is market-seeking. Today, developed countries account for an estimated 72% of the inward FDI stock in services, developing economies for 25% and CEE for the balance. In 2002, the United States was the largest host economy in terms of the size of its inward FDI stock in services. With a few exceptions (such as China), countries that have participated in the FDI boom in services also strengthened their position among home and host countries for all FDI. There is, however, considerable variation in the share of services in the FDI of individual countries. The composition of services FDI is also changing (table 9). Until recently, it was concentrated in trade and finance, which together still accounted for 47% of the inward stock of services FDI and 35% of flows in 2002 (compared to 65% and 59%, respectively, in 1990). However, such industries as electricity, water, telecommunications and business services (including IT-enabled corporate services) are becoming more prominent. Between 1990 and 2002, for example, the value of the FDI stock in electric power generation and distribution rose 14- fold; in telecoms, storage and transport 16-fold; and in business services 9-fold. 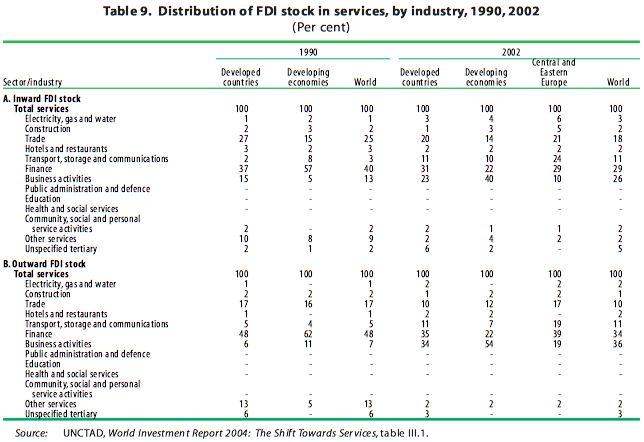 What explains the shift of FDI towards services? Partly it reflects the ascendancy of services in economies more generally: by 2001, this sector accounted, on average, for 72% of GDP in developed countries, 52% in developing and 57% in CEE countries. Moreover, most services are not tradable – they need to be produced when and where they are consumed. Hence the principal way to bring services to foreign markets is through FDI. In addition, countries have liberalized their services FDI regimes, which has made larger inflows possible, especially in industries previously closed to foreign entry. Of particular importance has been the privatization of State-owned utilities in Latin America and the Caribbean, and in CEE. Firms have reacted by expanding their service production abroad. Traditionally, FDI in such services as banking, insurance and transportation had been undertaken by firms moving abroad to support or complement trade or overseas manufacturing by their manufacturing clients. This is still taking place, but the pattern has been changing: service providers more and more invest abroad on their own account, as they seek new clients and exploit their own ownership advantages. Added to that are competitive pressures. In non-tradable services, growth remains the principal location advantage for attracting FDI. In directly tradable services, the main location advantages are access to good information and communication technologies, an appropriate institutional infrastructure and the availability of productive and welltrained personnel at competitive costs. … and with M&As and non-equity arrangements as the most common entry modes. The shift towards services is also discernible in cross-border M&As. In fact, most M&As during the second half of the 1990s took place in services and then became a widely used mode of TNC entry. While, in the late 1980s, services accounted for some 40% of global cross-border M&As, their share rose to more than 60% by the end of the 1990s. Up to the 1980s, cross-border M&As were almost exclusively the domain of United States TNCs. Since then, EU TNCs have become the dominant actors: in 2001-2003, they accounted for 61% of all M&A purchases worldwide. Cross-border M&As have also played a prominent role in the overseas expansion of services by TNCs based in developing countries. Overall, the propensity of TNCs to enter new markets through M&As, rather than greenfield FDI, is much greater in such service industries as banking, telecommunications and water. Privatization programmes open to FDI, which peaked in many countries during the 1990s, have added to the number of M&As. Across a number of service industries, the growth in TNC activity and international production takes the form of non-equity arrangements – e.g. franchising, management contracts, partnerships – rather than FDI. The greater popularity of non-equity forms in services as compared with goods can be explained partly by differences in the nature of the proprietary assets of the firms involved. Soft technologies and knowledge-based, intangible assets, rather than tangible ones, provide service firms with competitive advantages. Intangible assets, such as organizational and managerial expertise, can be separated from tangible and capital-intensive ones (such as real estate in the case of hotels or water distribution networks). More importantly, because the critical knowledge transferred by TNCs and the capabilities of the local firms are frequently codifiable (e.g. in management contracts), these can be equally well protected and enhanced by non-equity arrangements – and without putting capital at risk. For instance, quality control, performance conditions and minimum transaction costs can often be embodied in management contracts or franchising agreements. Nonequity forms are common in hotels, restaurants, car rental, retailing, accounting, legal and other professional services. However, such activity is not captured in FDI stock and flow data, or in data on the economic activities of foreign affiliates. International production networks in services are in their infancy, and service industries and TNCs are less transnationalized than their manufacturing counterparts – but they may be catching up. FDI in services has traditionally been, and continues to be, market-seeking, despite the increase in the cross-border tradability of many information-intensive services. While some services (e.g. financial and, especially, business services) can be rationalized internationally, leading to efficiency-seeking FDI, the integrated production of services on the whole remains in its infancy. In 2001, for example, 84% of sales of services by foreign affiliates of United States TNCs were local sales in host countries, while the corresponding share for goods was 61%. Nevertheless, there are signs that international services production is evolving in a direction similar to that of international goods production. In the United States, for instance, the share of intrafirm imports in total imports of “other private services” rose from 30% in 1986 to 47% in 2002. To the extent that integrated strategies of TNCs are being pursued, however, they take the form of simple rather than complex strategies, although world product mandates for foreign affiliates exist (e.g. accounting services for a corporate system as a whole), as do simultaneous international production networks (e.g. when affiliates in various countries work on a common R&D database at the same time). Despite the growth and dominance of services FDI, the services sector is less transnationalized than the manufacturing sector. Judging from data for selected, mainly developed countries, the degree of transnationality of services production, as measured by the shares of foreign affiliates in value-added, employment or sales of services in host and home countries, is lower than that in manufacturing, measured in a similar manner. Although a less satisfactory measure, the size of FDI stock relative to GDP in the two sectors for selected developed and developing countries indicates the same. This is because of: (i) the much larger size of the services sector; (ii) the continued provision by domestic enterprises of many services such as education, health, government services, media and transportation; and (iii) the relatively recent growth of FDI in other services (such as telecoms, electricity, gas and water and business services). Moreover, service TNCs have a lower degree of transnationality overall than their manufacturing counterparts (20% compared to 40%), according to United States data. However, the service TNCs on UNCTAD’s lists of the largest TNCs worldwide and those from developing economies are catching up fast with the manufacturing firms on the list. To start with, FDI in services, like FDI in other sectors, injects financial resources into a host economy. To the extent that funds are raised internationally, they are a net addition to resource flows into a host country. If funds are raised locally, domestic interest rates may rise, making capital more expensive for domestic enterprises, although the difference between locally-raised and foreign-sourced resources becomes less important as countries open up to international capital markets. A large part of services FDI is in market-seeking, non-tradable activities, which do not contribute directly to foreign-exchange earnings. At the same time, they entail external payments, for example, in the form of repatriated profits. Hence, FDI could have a negative impact on the balance of payments. And payments associated with FDI in services (e.g. repatriated profits) can quickly outweigh the initial capital inflow and exacerbate balance-of-payments crises. Counterbalancing such possible negative impacts are the potentially positive effects on consumers of final services, and on producers using intermediate services in terms of better service provision and spillover effects. FDI in services affects the provision of services in terms of supply, cost, quality and variety of services in host economies. In some industries, it can add significantly to the volume of services available in a host country. The financial strength of TNCs, together with their ability to implement and manage complex systems, enables them to expand supply capacities rapidly in complex, capitalintensive services, such as telecommunications and transportation. However, in the absence of appropriate government policies and regulations, TNC involvement in utilities and other basic services may lead to a rise in prices, an inequitable distribution of services and limited access for the poorest segments of society. Concerns also arise about the impact of services FDI on competition and the possible crowding out of domestic firms. In banking, for instance, foreign bank entry is sometimes found to be associated with a deterioration of the loan portfolio of domestic banks, a situation that potentially undermines their viability. Domestic banks face a challenge in competing with foreign banks due to their lack of geographical diversification and experience, limited financing capacity and higher costs of new product implementation. In industries such as retailing, the presence of TNCs introduces new ways of doing business, new pricing structures, improved information management processes and new marketing and merchandising methods; all these can squeeze out local producers – although, for the remaining ones, especially when they are able to upgrade, the effect may be beneficial. FDI can spur local service providers to become more competitive through demonstration and skills diffusions, thus helping them improve efficiency. All in all, the competitive impact of FDI entry on service supply conditions, as well as the likelihood of its crowding out domestic firms, depend considerably on initial conditions in a host country, especially the level of economic and service-industry development, market structure of service industries and the regulatory framework. One of the biggest contributions of FDI in services to development is in the transfer of technology. Services TNCs can bring both hard technology (plant, equipment, industrial processes) and soft technology (knowledge, information, expertise, skills in organization, management, marketing). Soft technology is captured in skills – which is often reflected in wages. Evidence on employee remuneration in foreign affiliates of United States-based service TNCs in developing countries suggests that they are more skill-intensive than their manufacturing counterparts. In addition, compensation in service affiliates in developing countries is much closer to that of affiliates in developed countries than in the case of manufacturing. Both reflect the stand-alone nature of many service affiliates, which requires that the skills profile of parent firms be largely replicated in their foreign affiliates. What determines whether or not skills transfer actually materializes are the intensity of competition, the quality of education and training in host countries, the training and personnel policies of TNCs, labour market structure and mobility, and linkages between foreign affiliates and domestic service suppliers and buyers. Although evidence exists that services FDI does provide some transfer of skills, expertise and knowledge, data on the overall extent of such transfers are scarce. Direct exports by service TNCs have been relatively limited until recently, but their indirect impact on export competitiveness can be significant. FDI in intermediate services can directly and indirectly improve the efficiency of industrial products. Such services range from banking, insurance and business services to transport, electricity and telecommunications. International hotel chains play an important role in promoting competitiveness in tourism by helping to attract a critical mass of international tourists. Tourism is an important foreign-exchange earner for developing countries, through both equity and non-equity involvement. FDI in services generates employment in host countries, although less so per dollar invested than in manufacturing. Moreover, employees in foreign service affiliates are, on average, better trained and better paid than those in manufacturing. These differences again arise mainly because of the stand-alone nature of most foreign affiliates in services and the (still) limited ability of TNCs to separate labourintensive activities and locate them in countries with lower labour costs. However, the potential for job creation is growing with the rise of FDI in export-oriented services. Indirect effects are also important, with services FDI supporting production in upstream and downstream industries, thus potentially adding to employment there. … and managing services FDI requires appropriate regulatory structures. Both direct and indirect benefits associated with services FDI can boost national and export competitiveness. However, benefits may not be realized if conditions in the host economy are not right. Services FDI can entail three kinds of risk: (i) systemic risk, when the absence of efficient regulation exposes a host economy to significant economic instability; (ii) structural risk, when the institutions and instruments needed to manage, say, privatization and utilities, are weak and there is the risk of turning State-owned monopolies into private ones; and (iii) contingent risk, when FDI in socially or culturally sensitive areas causes unintended harm. These risks imply that, while services FDI is becoming an important element of competitiveness, it has to be managed carefully. Indeed, the special nature of some services, particularly in basic utilities and socially or culturally sensitive areas, means that free-market forces may not provide the desired outcomes. Strong, independent and competent regulatory structures are vital if the potential benefits of FDI are to be tapped. Considerable skills and information, as well as the ability to draw upon the experiences of regulators in other parts of the world, are required so that developing countries can build the appropriate structures and reap the maximum benefits from services FDI. Services typically need to be produced when and where they are consumed. In the past decade or so, advances in information and communication technologies have made it possible for more and more of these services to be produced in one location and consumed elsewhere – they have become tradable. The implication of this “tradability revolution” is that the production of entire service products (or parts thereof) can be distributed internationally – in locations offshore from firms’ home countries – in line with the comparative advantages of individual locations and the competitiveness-enhancing strategies of firms. This is a process well known in the manufacturing sector. While the offshoring of services is still in its infancy, the tipping point may be approaching rapidly. Offshoring represents the cutting edge of the global shift in production activity, giving rise to a new international division of labour in the production of services. While the fragmentation and globalization processes in services and manufacturing are similar, there are important differences. First, although the services sector is much larger than the manufacturing sector, only some 10% of its output enters international trade, compared with over 50% for manufacturing. Second, the pace of globalization of services affected by the tradability revolution is faster than in manufacturing. Third, whereas the relocation of goods production has involved, overwhelmingly, firms in manufacturing only, service functions are offshored by companies in all sectors. Fourth, the skill intensity is generally higher for offshored tradable services than for manufacturing located abroad, thus affecting white-collar jobs in particular. And fifth, services that are offshored may be more footloose than relocated manufacturing activities because of lower capital-intensity and sunk costs, especially services that do not require high skills. Obviously, not all corporate services and service functions can or will relocate. For many services, proximity to markets, interaction with customers, trust and confidence outweigh the possible benefits of an international division of labour. Further, technological limitations cannot be discounted. It is not possible for all service functions to be digitized and/or separated from related activities. Some businesses will continue to need localized services or person-to-person contact for exchanging highly confidential information or for adapting to rapidly changing customer needs. Regulations and legal requirements (e.g. regarding privacy) may also raise transactions costs and limit international trade in services. Certain services, such as insurance and banking, are required by law in some countries to be provided by companies established locally. The lack of international recognition of professional qualifications is another obstacle, as is the lack of globally agreed privacy rules. Some international locations also lack the capacity to host offshored service activities. These include the supply of reliable telecom infrastructure, appropriately educated workers, rising wage costs and high levels of attrition in the fastest growing destinations, all giving rise to shortage risks, at least in the short run. TNCs too have different perceptions of the risks and benefits of offshoring services and some are reluctant to do so. Cost considerations often trigger offshoring. For example, 70- 80% of companies interviewed in various studies mentioned lower costs as the main reason for setting up a shared service centre abroad. Cost savings of 20-40% are commonly reported by companies that have experience in offshoring. Savings relate both to the use of cheaper labour and the consolidation of activities in fewer locations. Hence, considerable savings can accrue from offshoring even among developed countries – where, in fact, most of it takes place. But cost is only the trigger. In fact, many of the pioneers offshored to access skills and to improve the quality of the services provided. And they are staying (and expanding) to take advantage of the entire range of benefits resulting from the international division of labour in the production of services. Once important firms have started to reap the benefits of this new possibility, others are likely to follow for fear of compromising their own competitive position. Hence, many more companies – large and small, from developed and developing countries – can be expected to establish their own international production networks or otherwise offshore the production of certain services. As a result, a wide range of newly tradable services is now entering the exports of countries, developed and developing alike. These can be simple, low-value added activities (such as data entry), or more sophisticated, high-value added activities (such as architectural designs, financial analysis, software programming, R&D). They span the full diversity of skills, and some cut across all sectors. The size of the phenomenon is, however, difficult to establish. As noted above, most outsourcing at present takes place domestically in the home country; only 1-2% of all business-process outsourcing to date is done internationally. Second, about 90% of all FDI projects during 2002-2003 in export-oriented services originated in developed countries. Firms from the United States dominated, with two-thirds of all export-oriented information and telecommunication service projects, 60% of call-centre projects and 55% of shared-service projects. 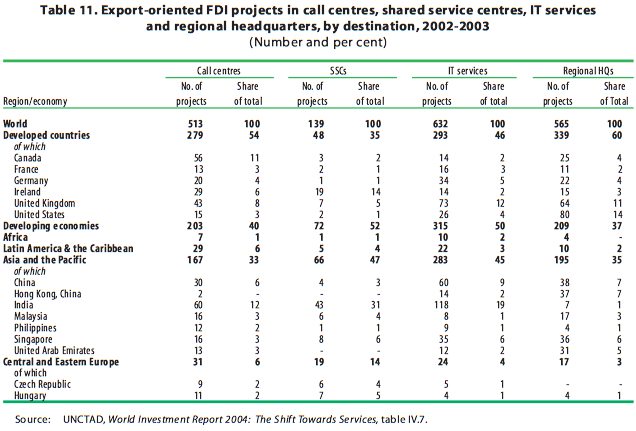 Third, a significant share of offshoring went to developed countries – for example, more than half of all export-oriented FDI projects related to call centres in 2002-2003. Ireland and Canada are among the most attractive offshore locations. No one knows how big offshoring will become. The total market for all offshore service exports is estimated to have been $32 billion in 2001, of which Ireland accounted for one quarter. The fastest growth is expected in the offshoring of IT-enabled services, which is forecast to expand from $1 billion in 2002 to $24 billion in 2007. Even among the 1,000 largest firms in the world, 70% still have not offshored any services to low-cost locations, but many have plans to do so. While United States companies have been relatively active, European companies have shown less inclination to offshore services. But there are signs that this is starting to change, beginning with the United Kingdom. Research undertaken in 2004 by UNCTAD, in cooperation with Roland Berger Strategy Consultants, found that 83% of large European companies with offshoring were satisfied with the experience, only 3% were dissatisfied, and 44% of the companies interviewed planned further offshoring in the coming years. This is likely to compel more companies to consider offshoring as a potential strategy to increase their competitiveness. Offshoring has a long way to go before it matures and settles down in pattern and location. A World Bank assessment of the mid- 1990s concerning the number of jobs for which long-distance provision is technically feasible and for which cost savings of up to 30-40% would be plausible suggested that some 1-5% of the total employment in the G-7 countries could be affected. More recent estimates by business research groups of the likely impact concluded that 3.4 million service jobs may shift from the United States to low-income countries by 2015; another concluded that 2 million offshored jobs could be created in the financial services industry alone, and that the total number of jobs affected for all industries could be in the area of 4 million. However, this should be compared with a turnover of 7-8 million jobs every quarter in the United States. While offshoring is creating new FDI opportunities, not all countries are taking part in this process. As with FDI and trade in general, developed countries attract a sizeable share. Given that services generally require higher skills than manufacturing activities, the barriers to entry can be high for potential host countries. For those that do manage to become export bases for services, key benefits include increased export earnings, job creation, higher wages and the upgrading of skills. Export revenues are considerable, as exemplified by India, where exports of software and IT-enabled services grew from less than $0.5 billion a decade ago to some $12 billion in 2003-2004. Jobs created in the services sector, including through offshoring, are typically better paid than in the manufacturing sector. But wage increases are also more rapid than in manufacturing, which makes offshored services more vulnerable to relocation to other sites. Given the short time needed to implement an offshore FDI project, attracting offshored services can offer fast-track job creation for successful host countries. FDI related to the offshoring of services may also be desirable because of spillover effects, especially if the services provided are also sold in the domestic market. Positive spillovers in terms of raising the competitiveness of human resources and improving the ICT infrastructure benefit all sectors of an economy, with most of the acquired skills being readily transferable to other parts of the economy. Negative spillovers, such as environmental pollution and overexploitation of natural resources are likely to be limited. At the same time, given that export-oriented services tend to be relatively skill-intensive, they are mostly geographically concentrated and require a well-developed infrastructure. Therefore, the scope for broader development benefits outside the most advanced regions of an economy may be constrained. In the case of software development, the potential for linkages between foreign affiliates and local firms has also been found to be limited, particularly when production is solely export-oriented and when services are provided on an intra-firm basis. Moreover, an influx of export-oriented services FDI may attract the best skills to certain types of service activities. Unless continuously upgraded, such activities may easily move on to another location if the competitive situation changes. Indeed, most offshored services are to date concentrated in a relatively small number of countries. In 2001, Ireland, India, Canada and Israel, in that order, accounted for over 70% of the total market for offshored services, mostly in software development and other ITenabled services. However, the share of developing countries and CEE in offshored projects is increasing. For example, between 2002 and 2003, their share in the total number of related FDI projects rose from 39% to 52% and their share in the number of jobs created by such projects reached 57%. Among developing countries, South and South-East Asia dominate as destinations for FDI projects related to service offshoring in developing countries (table 11), particularly in the area of IT services. India is the preferred destination for offshoring of virtually the whole range of services. Firms are attracted not just by its base of low-cost and skilled labour, it also has first-mover and agglomeration advantages. There is, however, scope for more countries to benefit from the offshoring trend, taking into account specific needs in terms of language skills, time zones and cultural affinity. …but it creates concerns that need to be addressed. The growth of services offshoring has given rise to concerns mainly in developed countries. In particular, the growth of white-collar, export-oriented service jobs in some developing countries is seen as leading to employment losses in developed countries. (The benefits arising from this new international division of labour typically receive less attention.) Consequently, proposals have been made – particularly in home countries – to constrain the trend towards offshoring. What is the likely impact of services offshoring on home countries? Offshoring is essentially a manifestation of a shift in comparative advantage, and offers all the advantages and costs of such a shift. It is not a zero sum game in which one party (the country receiving service work, be it developed or developing) gains at the expense of another party (the country offshoring services). Rather, it offers benefits to home countries as well. First, offshoring allows firms to reduce costs and improve quality and delivery, thereby enhancing their competitiveness, with positive effects on the home country economy. Second, it allows home countries to shift to more productive and higher value activities, depending on their ability to adapt to changing comparative advantage. The impact on jobs is likely to be similar to, but smaller than, that of technical change, which makes some jobs redundant and creates others, generally at higher wage levels. Finally, host countries that gain from offshoring and earn more foreign exchange spend more on imports of the advanced products that industrialized countries export. Indeed, there are no signs that offshoring leads to significant declines in similar service jobs in home countries. Recent estimates undertaken on behalf of the Department of Trade and Industry of the United Kingdom, for example, suggest that the number of call centres in the country is likely to increase from 5,500 to 6,000 over the next three years, and that associated employment will rise from below 500,000 in 2003 to 650,000 by 2007. At the same time, employment in industries that are expected to be the most affected by offshoring is showing rapid growth. In many cases, offshoring of services is a response to excess demand and the shortage of adequately trained people at home. Thus, every job created abroad as a result of offshoring does not necessarily equal a job lost in developed economies. Nevertheless, there are short-term challenges to consider. All shifts in comparative advantage entail adjustment costs at the micro level. Some people will lose their jobs, and there is likely to be a transition period in which they search for new ones. Many may have to acquire new skills or move to new locations to become employable. The challenge for home countries is to minimize such adjustment costs and make the transition process as smooth and efficient as possible for those directly affected. This does not require measures to force service jobs to stay at home, but rather policies that encourage education, training and R&D. Thus, instead of implementing protectionist measures, whitecollar workers in developed countries threatened with job losses could be given assistance (say, through retraining and with finding new jobs), similar to the trade adjustment assistance provided to vulnerable workers in manufacturing. Workers moving to new careers could perhaps be offered “wage insurance” to cover part of the difference between their former wages and new wages. Public-private partnerships could play a role in skills development, say through the use of fiscal incentives for employee training. Adjustment to any change in employment patterns needs greater labour mobility and changes in skills profiles. Preventing adjustment because of its costs would be only a short-term palliative, and could well handicap income and employment growth in the longer term. In the final analysis, protectionist measures are likely to destroy rather than save jobs in importing countries. In principle, the challenge for developed countries is the same as that facing developing countries as far as the cost side of offshoring is concerned. Given the risk of some services moving to new locations, even the countries that attract offshored services risk a relocation of those activities to even more competitive sites. There is a need for an enabling international framework to allow all countries to benefit from the advantages that the services tradability revolution can bring. Developing countries, in particular, should continue to be able to use their comparative advantage to benefit from the globalization of IT and IT-enabled services. Shifts in comparative advantage rarely offer immediate and visible benefits to all concerned. However, the economies from which services are offshored have to ensure that their workers share in the gains enjoyed by enterprises that become more competitive, and that customers get better and cheaper services. Governments need to introduce adjustment policies and consider the longer term benefits of globalization. Holding back offshoring to avoid adjustment costs would strengthen the critics of globalization, who argue that the rich countries only support globalization when they reap immediate gains. Hence the challenge is to maintain an environment in which the benefits from FDI in services in general, and offshoring in particular, can materialize. The WTO’s General Agreement on Trade in Services may be of relevance in this respect. In line with their development objectives, countries are gradually opening up to FDI in services and actively seeking to attract it,…. Returning to FDI in all services, there is a growing recognition by governments that, on balance, they benefit from such investment. The result has been a broad-based opening up to services FDI, although, the degree of openness varies across countries and industries. In general, developed countries are more open than developing ones. But even countries that have liberalized most of their service industries typically retain entry restrictions in specific services, such as media and air transportation. The nature of restrictions and the purpose for which these are introduced vary by industry. Services FDI can bring economic benefits, but policy-makers need to strike a balance between possible efficiency gains and other broader development objectives. Beyond that, more and more countries are seeking actively to attract FDI in services through investor targeting. IPAs are particularly interested in attracting foreign-exchange-generating services, such as computer and related services, tourism and hotels and restaurants. They are also targeting service functions of manufacturing firms, especially call centres, shared-service centres and regional headquarters functions. In this context, many export processing zones shape their promotional packages to attract services-related FDI beyond commercial services and simple data entry, to include, for example, medical diagnosis, architectural, business, engineering and financial services as well. Countries are also setting up technology parks specifically geared to FDI in IT services, offering high-quality telecommunications, stable power supply, a highly educated workforce and a technology-supporting infrastructure. General promotion measures, incentives and export processing zones are the most widely used tools for FDI promotion. Incentives, used in the whole range of service industries, are most common in tourism, transport and financial services. As in manufacturing, there is the risk of a race in the use of incentives, especially to attract exportoriented FDI in services. This risk is accentuated by the footloose nature of many export-oriented service projects. Investment promotion can be particularly successful if the basic requirements are right. For services, skills are vital, as is a reliable, state-of-the-art international communications infrastructure, especially if offshored services are targeted. Regulatory issues are also receiving increasing attention, particularly in the area of data security, an area that needs to be improved in a number of destination countries. The promotion of FDI in services should be complemented by policies aimed at addressing possible concerns about such FDI, as well as maximizing the benefits from the presence of foreign companies in this sector. The main rewards of FDI accrue over the longer term, when TNCs strike local roots, expand operations, improve local skills, link up with local institutions and upgrade technologies. Governments need to induce market-seeking TNCs to deepen and extend their operations, and export-oriented ones to stay and upgrade as wages rise and cheaper competitors appear. Policies in this area should seek to improve local capabilities, skills, institutions and infrastructure in line with the changing technological and market realities. …including through privatization, which requires the implementation of complementary policies. The opening up of various infrastructure services to FDI in the framework of privatization programmes has triggered unprecedented increases in such investment. While involving foreign companies in infrastructure services can bring new capital and more and better services, it can also entail costs. FDI in services through privatization raises a special challenge in terms of regulation and governance. the privatization of services. For privatization to succeed, it is particularly important for a government to strike a balance between budgetary and other considerations, such as the efficient and competitive provision of services at affordable prices for the poor and/or those living in sparsely populated areas. Large privatizations require an appropriate institutional environment that guarantees policy consistency, coherence and efficiency. TNCs are sophisticated institutions, and transactions and related contracts tend to be technical in nature and involve the monitoring of numerous post-privatization obligations. Specialized privatization agencies can help by undertaking a competitive selection process, providing a one-stop shop for investors, as well as maintaining independence from governments and vested interests in State-owned enterprises. The regulation of service industries is another challenge. While foreign investors are often attracted to assets that enjoy monopolistic or oligopolistic rents, the interest of host countries is to minimize those rents, including through well designed regulatory regimes. Such regimes should address the ability of investors to collect payment for the services they provide; they should also contain clear principles for tariff-setting and procedures for dispute settlement. In addition, they need to address issues related to securing universal access to essential services, taking into account the situation of poorer and remote populations. Furthermore, regulatory regimes should be complemented by an appropriate policy to encourage competition. The restructuring of an industry prior to privatization may be helpful; in low-income countries, this process can perhaps be facilitated through related official development assistance. Services IIAs are proliferating, creating a multilayered and multifaceted network of rules that present challenges for development. Over the past decade, the number of international investment agreements (IIAs) covering FDI in services has proliferated, resulting in a multilayered and multifaceted network of international rules. In many areas of services FDI, therefore, national policy-making increasingly takes place within the framework of these agreements. Agreements differ in their approach towards services FDI (investmentbased, services-based, mixed) and in their substantive provisions (e.g. regulating entry as opposed to protecting investment, adopting a positiveas opposed to a negative-list approach when making commitments). Several services IIAs contain follow-up procedures and separate chapters for specific service industries. IIAs can provide a stable, predictable and transparent framework for attracting FDI in services and benefiting from it. At the same time, there is a complex process of interaction between international and national policies for services FDI. The nature of this interaction can be either autonomous-liberalization-led or IIA-driven, or anywhere in-between. Ultimately, this interaction is country- and context-specific, thereby creating additional challenges for policy-makers seeking to regulate services. Moreover, policy-makers need to ensure that international rules are consistent with or complementary to each other in order to avoid conflicts. They also need to address issues arising at the interface of the liberalization and regulation of services. Finally, policy-makers need to strike a balance between using services IIAs for attracting FDI in services and preserving the flexibility necessary for the pursuit of national development objectives related to the services sector. It is important for IIAs to allow such flexibility. This is particularly important for developing countries, as they need to accommodate their development-oriented policy objectives and to undertake the sort of trial-and-error processes required to identify the policy options best suited to their level of development. Still declining in 2003, FDI flows show signs of recovery,… …driven by TNCs from developed countries, but with increasing participation by developing-country firms. Trends and prospects vary by region, with turnarounds in Africa and Asia and the Pacific,… … another decline in Latin America and the Caribbean, a plunge in Central and Eastern Europe… …and uneven performances in the industrialized world. The composition of FDI has shifted towards services in all regions, … … driven by various factors, … … and with M&As and non-equity arrangements as the most common entry modes. International production networks in services are in their infancy, and service industries and TNCs are less transnationalized than their manufacturing counterparts – but they may be catching up. FDI in services can have benefits – and costs – for host countries,… … and managing services FDI requires appropriate regulatory structures. The offshoring of services, still a relatively new phenomenon, is on the rise,… …driven by the search for competitiveness … ... and offering export opportunities for countries with the right mix of costs, skills and infrastructure,… …but it creates concerns that need to be addressed. In line with their development objectives, countries are gradually opening up to FDI in services and actively seeking to attract it,…. ...including through privatization, which requires the implementation of complementary policies. Services IIAs are proliferating, creating a multilayered and multifaceted network of rules that present challenges for development.